Mullan wasn’t one of the four North Idaho boys basketball teams that played for a state trophy on Saturday. It hasn’t qualified for the 1A Division II tournament in 13 years. A student body of 23 has put the shrinking mining town’s athletic programs in a quandary. But even with its current plight, wins aren’t a phenomenon in Mullan, a school drenched in pride and tradition since its former glory in the 1980s, ’90s and early 2000s. The Tigers’ fortunes often align with the success of the town’s Lucky Friday Mine, where union members have been on strike for nearly two years. After years of struggling to field an 8-man football program, Mullan joined a rare interstate co-op with nearby St. Regis, Montana, last fall, a move that helped put about a dozen bodies on the roster. The co-op was also considered for basketball, but the prospect of students making the regular 40-mile trek between Mullan and St. Regis over Lookout Pass during the winter months was too risky. Merging with down-the-road rival Wallace – a healthy 1A school with as many 8-man football players as Mullan has students – would do just enough to bump the Miners to the 2A classification. That wasn’t happening. If Mullan – located in a sheltered canyon of the scenic Coeur d’Alene Mountains – was going to continue to field a basketball team, history teacher and coach Paul Elston knew depth would be nonexistent. “It’s really interesting when you walk in a gym and there’s just five players and your assistant coach,” Elston said. That gym, the Mullan Athletic Pavilion, has been host to the North Idaho all-star high school basketball game the past 20-plus years. It was recently the site of another spectacle. Mullan played its entire 18-game season with five players, with nary a substitution. It barely had enough bodies for a working layup line. Scrimmages were a luxury enjoyed when middle-schoolers and coaches would help form a makeshift scout team. The ironman Tigers (7-11) still won a few games, besting the likes of league rival Clark Fork, Superior-Alberton (Montana) and Lake City’s “C” team. Foul trouble and injuries put Mullan in 4-on-5 scenarios on three occasions. Not that the young Tigers avoided applying full-court pressure. Mullan trailed Superior-Alberton by 17 points at halftime, Elston said, before employing a turnover-forcing press that lifted to the Tigers to a 52-40 win. Their supplemental conditioning paid off. “It’s amazing what kids can do when they’re tired in close ballgames,” said Elston, who said he had six players on his roster for all of three hours before a season-ending injury. Genesis Prep, a 1A Division II power that plays in the North Star League with Mullan, handed the Tigers a 50-point loss in November. 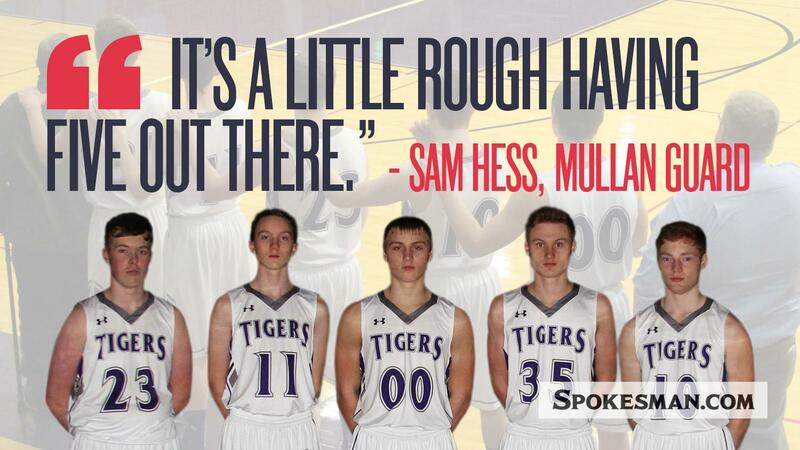 Still, Genesis Prep coach Marsell Colbert said he was both impressed and taken aback by Mullan’s five-man crew. “Those kids loved the game so much that they were to play a full season with just five players,” Colbert said. “That is a testament to those kids, and I also think (Elston) did a heck of a job. Mullan, paced by freshman Luke Trogden (13.9 ppg) and sophomore Riley Trogden (12.3 ppg), forecasts somewhat of a resurgence in the next couple of years because of a 15-student seventh-grade class. “This is a community that’s very independent and very proud of their athletic tradition,” Elston said. Published: March 3, 2019, 5:19 p.m. Updated: March 3, 2019, 8:56 p.m.